Academy Award/Oscar winner, Italian film & television actor, writer, director, and wild man Roberto Benigni was reciting a page from Dante's poem on the afterlife when shots rang out Tuesday night. Benigni was performing in a piazza in the southern Italian city of Cosenza. Upon hearing the gunfire, Benigni said: "What, is hell here, too?" but then resumed his performance. 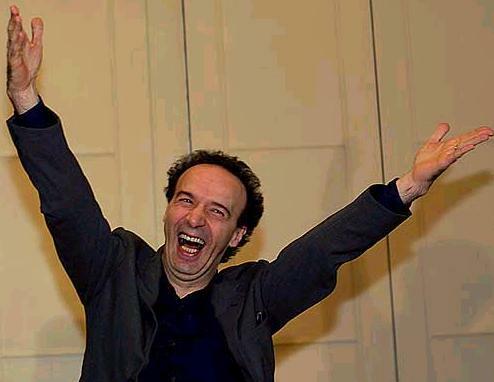 Oh, that crazy Benigni ! A security guard had stopped a man who was trying to get into the show without a ticket. The man then pulled out a gun and fired six shots, five of which hit the security guard in the legs. The guard was hospitalised but the injuries weren't considered life-threatening. A 45-year-old man with a police record for minor crimes, was arrested for attempted murder. Benigni said he was sorry about the incident, but also thought it was poetic. "The poetic greatness is that he did that just to hear Dante," Benigni said. "I'm sorry, and I feel for the kid's family, but he did it for poetry, and that's a great thing." The 54-year old Benigni is touring Italy with a show called "Tutto Dante" in which he mixes political satire with readings from "The Divine Comedy" - the allegoric voyage through hell, purgatory and paradise written in the early 14th century by Tuscan poet Dante Alighieri. Benigni, a Tuscany-born comic, is best known for directing 1997's tragicomedy "La vita è bella / Life Is Beautiful," which won the best foreign film Oscar in 1999 and earned him the award for best actor.